Because I live 35 minutes from the Mexican border in San Diego, I go to Mexico at least twice a month. My family has a second home two hours south of Tijuana, in La Bufadora Ensenada and we go there as often as we can manage. This week I'm sharing with you some of my favorite recipes from the Baja Gold Coast-or that stretch of 100 miles from Tijuana to La Bufadora. It's only a teaser, and by no means all-inclusive as there are way too many great restaurants serving all kinds of mouth-watering delights to even contemplate reproducing here! I've included Martinis from Punta Morro Restaurant in Ensenada, Summer Nopales Salad from Celia's Restaurant in La Bufadora, Crab Enchiladas from Calafia, Lobster from the famous town of Puerto Nuevo just south of Rosarito Beach , Orphan Calamari from Restaurant La Bufadora and to finish things off-Churros which are a sweet treat everyone loves! So enjoy your taste of Baja Norte. Pick your favorite recipes and make a meal of them! On the northern edge of Ensenada, hanging right out over the Pacific, is the exquisite gourmet restaurant, Punta Morro. It's the kind of place I reserve for celebrations marking special occasions. The presentation of their Martini is something right out of Hollywood. And the hint of Scotch they add to it makes it smooth, smooth, smooth! Just imagine yourself sitting back, sipping your Martini as you watch those waves crash onto the rocks below you and explode skyward. As the moonlight dances across the ocean's surface, check out the menu and order on of their mouth-watering dinners, served with gourmet homegrown vegetables from the nearby Guadalupe Valley. This recipe, shared with me by my waiter, serves two. It takes only a few minutes to make too. Chill two Martini glasses in the refrigerator. Fill bucket with ice and water. In urn, mix Gin or Vodka with Vermouth and Scotch. Place in ice bucket to chill. Place a sword or toothpick with three skewered olives into each Martini glass. Serve the bucket of Martinis with the two glasses and pour about an inch or liquor into each. Hint: If you have no way of locating the bucket or urn-you can make these Martinis the old fashioned way in a shaker with slightly crushed ice. When thoroughly chilled, pour into Martini glasses and serve as above, leaving the shaker on the table so your guests can refill their own glasses. Celia owns one of the restaurants in La Bufadora, just south of Ensenada at the tail end of Baja Norte's "Gold Coast." Let me tell you-not only does the lady know how to cook, but she is a veritable fount of information on how to get along in Baja. She understands the culture, she knows the rules, and if she likes you, she may even give you a pointer or two on how to play the game. You can pick the nopales (tender, young prickly pear shoots) yourself in spring and early summer if you live in the southwest. Or, if you have a Hispanic market near your home, you can buy fresh nopales already cut and cleaned in the produce section or buy them canned here at mexgrocer. Either way, you will be able to make this festive, original and surprisingly delicious salad for yourself. 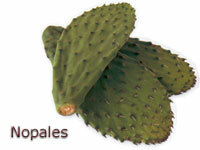 Serves six and takes about 20 minutes to prepare if you use canned nopales. 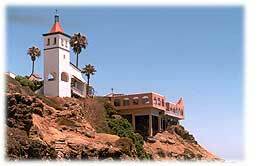 A few minutes south of Rosarito, or about 25 minutes south of the border at Tijuana, is Calafia. It has been around for as long as I can remember and is famous for its rocking and rolling pirate ship, painted in an array of wild colors that hangs precariously out over a hot surf spot on the Pacific Ocean. The deejay actually plays his music from inside the ship as revelers dance the afternoons and nights away on its wooden decks or on one of the restaurant's many patios. More sedate or hungry people can order lunch at one of the many outdoor tables terraced down the side of the cliff, overlooking the crashing waves (and the dancers). This recipe for Crab Enchiladas was inspired by one of our escapades to Calafia. They've become a big time favorite in Northern Baja as well as in Southern California, where seafood and Mexican food enjoy a symbiotic relationship, and Nina was dying to get the recipe. So she ordered them, but she was the only one who did. When our food arrived, Nina raved about these enchiladas with such enthusiasm that the other people in our group began attacking her plate and nearly wiped it out before she could finish a single enchilada! In our family we've always called that the "wandering fork game" and Nina has always been our star player, as her fork can dart in and out of other people's meals faster than anyone I've ever known. This time it was kind of amusing to see the tables turned on her. Because the waiter refused to give us the recipe, we proceeded to analyze the ingredients. After a bit of trial and error in the kitchen, this recipe was born. Serves four and takes about 45 minutes to prepare. Melt butter and oil in a medium saucepan over low heat. Add garlic and onion and cook over medium heat until translucent. Remove from heat and add chili powder, crab, mayonnaise, salt and cilantro. Heat enchilada sauce in another saucepan. In a skillet, heat oil until a drop of water sizzles when placed in the pan. Fry a tortilla lightly on both sides so it is still pliable. Using tongs, remove it from the pan. Dip it into the enchilada sauce and lay it inside a 9 x 14 pan. Stuff enchilada with crab mixture, cheese and onions. Roll and place seam side down in the pan. Repeat with all tortillas. When all enchiladas are made, place the pan in a 350 degree oven for about twenty minutes. Remove from oven, pour remaining enchilada sauce over enchiladas until almost covered. Top with remaining cheese and onions. Broil for one to two minutes until cheese is melted. Serve immediately and await compliments. Thirty miles south of the Tijuana border is what used to be a fishing village called Puerto Nuevo (or Newport in English). In recent years its size has multiplied many times over until it has reached resort proportions. Puerto Nuevo is renowned throughout Southern California for its succulent lobster. In the old days, local fishermen cruised the shoreline in their pangas (motor skiffs) and free dove for the lobster off the rocks-often without wet suits-or scuba gear in the fall when the ocean wasn't exactly at its warmest. These days everything's a little more sophisticated, but the lobster is still fresh and delicious. There are lots of restaurants in Puerto Nuevo now, but when I first went there in the late seventies, there were only three plywood and tarpaper shacks with dirt floors that served lobster this way. And what they served the lobster with back then was nothing more than refried beans and corn tortillas. Puerto Nuevo lobster is deep fried in lard, the Mexican way. If you don't want to fry your lobster, try grilling it on the barbecue or boiling it in water plus a half cup of beer for five minutes. Frosty beers or Cokes a must with this one. Serves six to eight and takes about 30 minutes to prepare. In heavy, deep skillet heat lard over medium high heat. Fry each half lobster for five minutes on each side, until meat is crisp, tender and will pop out of the shell on your fork. Continue for all lobsters. Drain on paper towels and place on serving dish in the oven on warm until ready to serve. Heat frijoles and rice. Place in serving dishes. Heat tortillas in microwave one to two minutes until warm. Place in covered bread basket. Serve lobster with frijoles, rice, tortillas, salsas. People can eat the lobster either in a burrito with beans and salsa, or solo. The Mexicans use tortillas the way our ancestors used bread, to scoop up and mop up their beans, rice, excess pan juices and salsa. Try it out yourself. Miguel Toscano (son of our patron, SeZor Jos� Le�n Toscano )used to run the La Bufadora Restaurant. When I asked him what his house specialty was, he told me, "Orphan Calamari." I didn't get it. "It's so delicious that in Spanish we say it needs no parent," he explained. I was still confused. Finally, he told me that a good translation for orphan in this sense would be, "outasite." Okay-I got it-Outasite Calamari. After he gave me the recipe, he led me into the kitchen where his chef, Ricardo Vazquez, prepared two orders for us. As I watched, I scribbled like crazy. Afterwards, the guy I was with scarfed both of our servings down. It's not difficult to make, it serves six and it will earn you the reputation as a bona fide Northern Baja chef. Allow 20 minutes to prepare. Partially defrost the calamari steaks. Using a knife, peel off the membrane surrounding the flesh. Put steak in a plastic bag, lay on a cutting board and pound until almost lacy. Repeat. Dredge steaks in flour. Season eggs with salt, pepper and red pepper sauce. Add milk to egg mixture. Dip calamari into eggs, then dredge again, in corn flake crumbs. Heat butter with oil in skillet until melted. Add garlic and calamari steaks and cook until golden on both sides. Place in oven to keep warm. In another skillet, mix together all ingredients for sauce, stirring constantly. Add flour and thicken to desired consistency. Spoon over calamari steaks and enjoy! 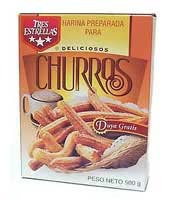 Churros are Spanish doughnuts, squeezed out through a pastry bag and fried in long ribbons. In Spain they are served with piping hot chocolate. In the mall at La Bufadora, vendors wave them in front of your eyes, offering you a free sample in hopes that they can entice you to buy a bag for $1.00. You can also buy them as you wait in line to cross the border from Tijuana back into the U.S. Recipe makes 1 1/2 dozen churros. Allow 20 minutes to prepare. In a medium sized saucepan, combine water, salt, sugar and butter and bring to a full boil over high heat. Add flour and remove pan from heat. Beat mixture with spoon until smooth and it comes away from the sides of the pan. Add eggs, one at a time and beat well after adding each egg. Stir in lemon extract and cool for 15 minutes. Put half the dough in a large pastry bag with a large star tip. Heat oil in deep skillet or deep fryer to 400 degrees. Squeeze dough into oil until you have a ribbon about 7 to 9 inches long. Cut it off with a knife. Fry 2 to 3 ribbons at a time for 6 or 7 minutes each. When golden brown, remove from oil and drain on paper towels. Sprinkle with cinnamon sugar and serve warm.